No matter how you say it, eggplant is good. I’ve had it many different ways and I have never had an eggplant that I did not like. From crab and shrimp stuffed eggplant at Galatoire’s Restaurant in New Orleans to a spread served on pita at a party in someone’s home, it’s all good. There are recipes for eggplant in almost every country in the world and one of the most popular dishes among some of our foreign cultures. One recipe that you just cannot beat is for Hot & Spicy Eggplant. This recipe also gives you the opportunity to use a few other fresh ingredients from your garden such as tomatoes, peppers and basil. It is a dish that can be made ahead and chilled to be served later at your party, or to your family. Bring out the French bread toasted with a little garlic oil or butter and spread the joy. Preheat oven to 350º F. Halve the eggplant lengthwise and place it cut side down on a lightly oiled baking sheet. Bake for 30 to 40 minutes or until it pierces easily with a fork. Cool. Meanwhile, heat the oil in a heavy 12-inch skillet over moderate heat. Add the onion, green pepper, and garlic and cook, stirring occasionally until soft, about 5 minutes. Stir in the tomatoes, vinegar, basil, capers, salt, cayenne, and hot red pepper sauce. Scoop the eggplant flesh into a food processor or blender and process for 10-15 seconds, or until nearly pureed. Stir the eggplant into the skillet mixture. Simmer uncovered for 15 minutes, stirring occasionally. Cool, cover and refrigerate for several hours or until well chilled. *Hot & Spicy Eggplant will keep refrigerated for up to 3 days. Makes 4 cups. Make French bread garlic toast by mixing fresh minced garlic with olive oil, and spreading it on the bread. 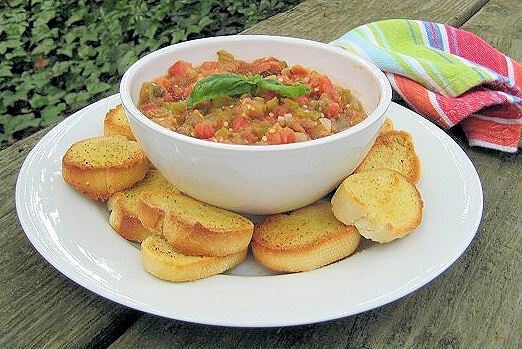 Bake or toast bread until golden brown and serve with Hot & Spicy Eggplant.